Around 1,000 suppliers from almost the whole of Europe can be quickly found, each with its individual product or service programme, sorted according to postcode in the respective country/region. The FocusRostfrei-HÄNDLERVERZEICHNIS is published twice a year – always in February and July – with a circulation of 12,000 copies. 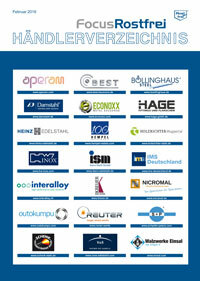 Would you like your company to be included in the FocusRostfrei HÄNDLERVERZEICHNIS?